American imperial stout brewed with black walnuts, aged in bourbon barrels, and conditioned on coffee. Bottle: Poured a pitch-black color stout with a nice large dark brown foamy head with good retention and some lacing. Aroma of light roasted malt with some black chocolate notes, coffee with some bourbon, vanilla and light woody notes are also perceptible. Taste is a mix of black chocolate notes with quite a bit of residual sugar notes with some light floral coffee notes and some bourbon, subtle vanilla and woody notes. Body is about average with good carbonation. Enjoyable but I was expecting a bit more bourbon notes. Dark brown/black appearance. Fuller bodied for the style. The beer was capped by a small, bubbly, khaki colored crown that quickly dissolved. A thin collar encircled the oily looking liquid. Streaks and drops of patchy lacking trickled down the glass. Bourbon notes came through strong in the aroma. Loads of fresh vanilla bean too. Some brown sugar sweetness was apparent. Raisins were also noticeable. Unfortunately, I picked up no walnut or coffee. Overall, very pleasant but not super complex. Both the bourbon and the sweetness intensified as the beer warmed. The flavor was similar to the nose though perhaps not as rounded. Big roasted malt presence on the front end. Touch of caramel too. Vanilla notes appeared in the center. The beer finished with a moderate boozy/bourbon quality that smoothed out as the beer warmed. Subtle raisin notes also came forth, as did the overall sweetness. A touch of bitter char lingered after the swallow. The beer was medium bodied bodied for the style. Oily and slick on the palate. The liquid contained a moderate effervescence that turned creamy and smooth on the palate. After a few sips, I could feel the sugars in the beer leaving a slightly sticky film on my lips. Despite the fact that I picked up neither coffee nor walnuts in this, Oil Of Aphrodite - Bourbon Barrel-Aged With Coffee was a tasty and enjoyable, though perhaps somewhat forgettable, imperial stout. 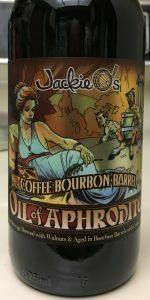 Jackie O’s beers were very hot commodities a few years ago, but I understand why today they seem to get lost in the fray. Very dark brown body topped by a small hot chocolate colored creamy head which dissipated quickly but left a tight bubbly lacing on the glass side. Sweet barrel boozy chocolate smell with other flavors coming in and out. Can taste the coffee faintly but maybe the year plus cellaring has faded it back with the walnut and dark fruits. Booze is there but not overly hot. Feel is perfect for a stout like this as the tastes linger in the mouth. I had the regular Oil of Aphrodite relatively fresh and don't recall it being nearly as good as this. Opaque ebony body with a thick, light tan head (pretty good for a high ABV beer); excellent lacing along the glass. Nice charred grain scent infused with bittersweet chocolate and coffee ground notes. Very rich and balanced flavor profile, mimicking the aroma but also adding some well-blending alcohol notes, some with bourbon tones. Heavy body; slick and oil; chewy; semi-sweet finish with a bit of alcohol heat. BA currently lists the ABV at 10.0%. The bottle label shows 12.1% ABV (update submitted). This beer pours black in color and is topped with less than an inch of mocha head that leaves little lacing. The smell has coffee, hints of bourbon, caramel and vanilla. The coffee is not in your face but present. It marries well with the bourbon. Caramel and vanilla give it a dessert character. Full bodied. Thick and viscous. This is a very good beer from a great brewery. It is not the best that I have had from them, but I wouldn't pass on it.